Simon Keenlyside in recital with Malcolm Martineau. Photo provided by Vocal Arts DC. 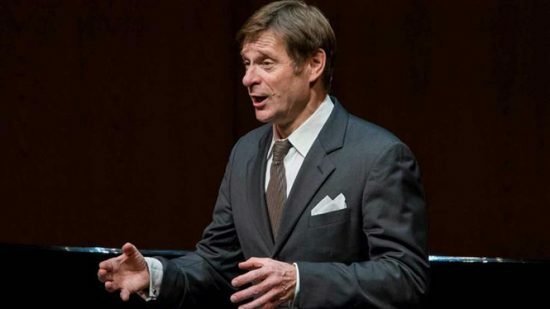 Friday night, Vocal Arts DC showcased world-renowned baritone Simon Keenlyside and celebrated pianist Malcolm Martineau in recital. This dynamic duo is no stranger to working together having collaborated previously on works including Dichterliebe and a collection of songs of war. Their program for this recital was composed entirely of classic German and French art songs by Schubert, Poulenc, Brahms, and Ravel. Despite the program being more “serious” (highbrow) in regards to its accessibility, Keenlyside and Martineau’s interpretations of these classic art songs touched even the most inexperienced listener with startling poignancy. This recital was, without a doubt, the most thrilling, moving, and inspired art song recital DC has seen in some time. One unexpected surprise at the start of the night was the artists rearranging the set order of the recital last minute in an attempt to improve the program’s fengshui. So the evening began with the closer, a German set by Schubert. As is common of Schubert’s lieder settings, most of these songs encapsulated a lively story complete with beginning, arc, and end. And Keenlyside and Martineau took advantage of every moment Schubert created to share this colorful story with us through the textures of their instruments. Keenlyside’s impeccable German and quick access to a wide array of dynamic colors gave off the impression of complete ease and interpretive genius in this Schubert set especially in “Herbstlied” and “An den Monde in einer Herbstnacht”. The opening Schubert set was followed by a peculiar and rarely done 20th-century collection of songs by Poulenc. In “Le travail du peintre,” each song describes the visual technique and emotional temperament of a famous painter of that time. Despite Poulenc’s disjointed melodic content being jarring to the ear, Keenlyside’s quirky characterization gave these obscure pieces authenticity that made them easily enjoyed, which is no small feat! Opening the second half of the program was a stunning set of Brahms lieder that showcased Martineau and Keenlyside’s clear proclivity for German art song. Through this set, Keenlyside gradually became more engaged with the audience, sharing the imagery he so clearly envisioned by looking up more and drawing us in with passages sung so lightly it would seem that we were imagining the sound of his voice. “Über die Heide” was one such song that Keenlyside and Martineau explored every moment and brought the text and music to life with their stunning techniques and commitment to interpretation. The program was closed out with two more French sets by Poulenc and Ravel. Poulenc’s “Quatre poèmes de Guillaume Appollinaire” showcased four quaint stories as vignettes and Ravel’s “Histoires naturelles” turned out to be the perfect match for Keenlyside’s erratic stage presence as these comedic poems are each based on the dispositions of random animals including a peacock, cricket, and guinea fowl. In between these two sets, Martineau performed Poulenc’s “II. Pavane: Grave et mélancolique” that effectively calmed the audience into solemn reflection before the duo dove back into the final comedic set. This recital was, without a doubt, the most thrilling, moving, and inspired art song recital DC has seen in some time. The talents of Keenlyside and Martineau as seasoned performers brought an entirely new level of perception to these classic songs that touched the heart and mind with lasting effect and solidified the importance of continuing the tradition to perform and appreciate art song. A full-hearted thank you to Vocal Arts DC for bringing such an unforgettable experience to the DC classical voice loving public. This recital had only one performance on Friday, November 30, 2018. However, if you are interested in seeing more art song recitals, be sure to check out Vocal Arts DC’s upcoming schedule which includes recitals with celebrated singers such as Angel Blue and Lawrence Brownlee! Click here for more information. Erin Ridge has been a lover of opera for just over 7 years now and was most recently seen at the D.C. Opera on Tap October show, "Witches of Wonderland". A self-professed champion of modern American opera and new works, she has performed mainstage roles in various productions around the Nashville area from Musto's Later the Same Evening to Sondeheim's Into the Woods to an original art song theatre work Seaworthy. Erin graduated with a BM from Vanderbilt University's Blair School of Music. When she is not busy singing or working her HR day job, she enjoys exploring Washington D.C's craft beer scene with her husband Jordan.